As long as there have been relays, there has been a need for specially designed tools to aid in making periodic adjustments. In order to clean, check, adjust and trouble-shoot all types of relays most efficienlty and effectively, a comprehensive set of tools designed for that purpose is needed. The Kit includes everything needed to clean, adjust and maintain relays in a convenient folding vinyl case with pockets. The 20-page instruction booklet "How to Adjust and Maintain Relays" is included in every TK-18 tool kit. A professional kit for maintaining relays, contacts, switches and controls. Includes a wide variety of test connecting tools, the famous guide pin screwdriver and wire unwrapping tool. Tools are made of the highest quality steel, guaranteeing long life and top efficiency. Comes in compartmentalized padded vinyl case with nylon, self-repairing zipper. 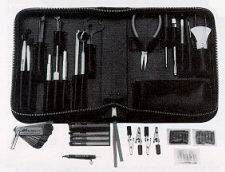 Tool kit consists of one of each of the following tools, except where otherwise indicated.